We just dropped the hook in Resolution Bay, on the island of Tanna, Vanuatu. It took us a little over 3 days to go 450 nautical miles. We motor-sailed most of last night and this morning to get here as the wind had died. Overall, the passage was good with the exception of our Monitor windvane rudder breaking with a piece of 1" tubular stainless steel pipe shearing in half from the force of some of the initial waves we had. On the first day we were seeing 20-30 knots of wind and consistent 12+ foot seas. We were flying. There are 7 other boats here, but it is a pretty good sized bay and very beautiful. We are only in about 15 feet of water and it is a dark and thick volcanic sandy bottom that makes for solid holding. The swell from outside still rolls in here, so it isn't ideal, but overall we've anchored in much worse rolly places than this spot. Reminiscent of the Marqueasas. Resolution Bay has some beautiful yellow sand beaches as well as a mix of black volcanic rock that create a "Hawaii-like" feeling. There is even a spot a couple of hundred yards away where hot springs and steam are leaking out from the volcanic rocks into the water. The live volcano of Mt. Yasur is also only mere miles away. Powerful place. On the down side, while launching super-dingy in the swelly conditions, Nicole got a nasty rope-burn when the halyard line she had wrapped on the mast wench came off and worked her right had pretty good. She has some of our amazing Silvadene burn cream on it now and will be taking it easy with her hands for a few days. It will be fine, but OUCH! Guess I'll have to be cooking more for a while. 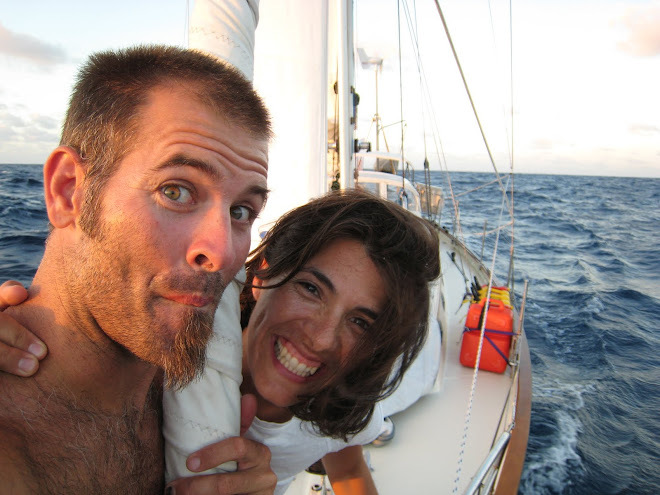 Thanks everyone for thinking of us on our passage and stay tuned for some Vanuatu adventures. Your journey is truly fantastic! I will be checking in often to look for new posts and to see where you are. I only wish I had know about your trip earlier so I could have been following you from day 1. Enjoy the experience, keep sharing.